With 19 verbal commits in the Class of 2019 already and the remaining spot – or spots – extremely limited for the current cycle, Notre Dame has the luxury of devoting the vast majority of its recruiting time for the final home game of the season toward underclassmen. The Irish will have some of their 2019 pledges in town along with 2020 tight end commit Michael Mayer, which is always important. As Matt Freeman reported on Friday, 2019 Hawaii athlete Marist Liufau‍ has been added as an official visitor. "The 6-foot-2, 200-pounder is listed as a cornerback by some services but Notre Dame is recruiting him as a linebacker," Freeman reported. "It's clear Notre Dame is looking for another linebacker in this class with the persistence of Asa Turner, so if an offer went out to the three-star prospect it wouldn't be surprising." Liufau holds offers from Arizona, Boise State, Hawaii, Oregon, San Diego State, UNLV, USC, Utah, Utah State and Washington State. One prospect, 2019 linebacker J.D. Bertrand‍ will be making his second visit in a matter of weeks as he looks to see if there ends up being a spot in the class for him, but much of the attention this weekend will be on players in the 2020 and 2021 classes. A pair of those 2020 prospects will arrive with offers from the Irish in hand – Oklahoma offensive lineman Andrew Raym‍ and Illinois defensive end Braiden McGregor‍. Raym visited South Bend for a game last fall only to commit to the in-state Sooners a month later. But he had some second thoughts about the early decision and in May, he publicly decommitted from Oklahoma. Notre Dame extended a scholarship the very next day and has been one of the top contenders ever since along with the Sooners, LSU, Michigan and Georgia. By the end of the fall, he will have visits each and his coach expects him to focus in on two or three from there. McGregor (pictured above) has made the relatively short drive down multiple times over the last year and was most recently in town for the Irish’s season-opener against Michigan. He’s made recent trips to Michigan, Michigan State and Ohio State and after deciding to speed up his decision-making process following his previous trip to South Bend, he’s expected to make a commitment within the next few months. So, this trip will be huge for the Irish. While the vast majority of the 2020 visitors won’t arrive with offers, it wouldn’t be a shock to see some leave with offers. 2020 North Carolina offensive lineman Mitchell Mayes‍ has more than a dozen offers from schools like Clemson, Tennessee, North Carolina, NC State and Virginia Tech among others. He was initially supposed to visit earlier this season, but had to cancel. The fact that he followed through by rescheduling is confirmation that he is truly intrigued with Notre Dame. 2020 athlete Kristian Story‍ is ready to brave the cold and make the trip up from Alabama. The 6-foot-2, 205-pounder who could play anything from quarterback to defensive back, has an impressive list of offers that includes Alabama, Georgia, Tennessee, Penn State, Oregon and Nebraska among others. He’s been in contact with the Irish for a while and was intent on getting to this weekend’s game despite the weather. 2020 Texas cornerback Avery Helm‍ has heard plenty about Notre Dame and when he was invited, he decided he wanted to see it for himself. His offer sheet includes LSU, Ole Miss, Arizona and Syracuse among others. 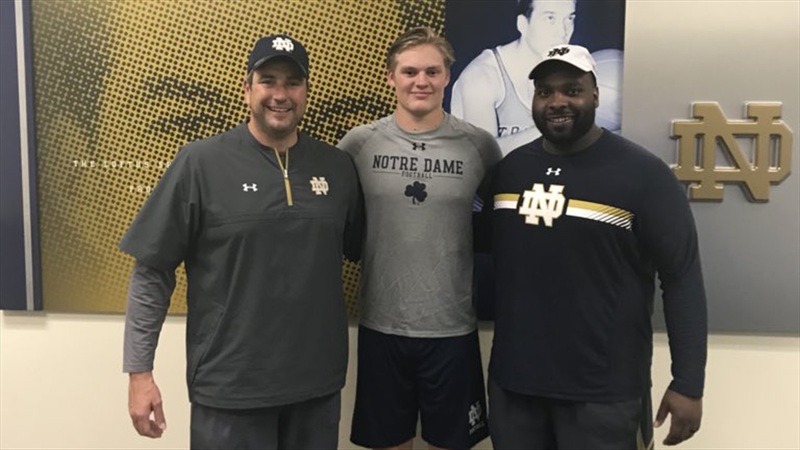 He said he’s looking forward to seeing the tradition and game atmosphere in South Bend, but academics will be a crucial factor in his final decision. “The most important thing to me is getting my degree and life after football and having the best chance to go to the NFL or having a good job,” he told us. 2020 Kentucky wide receiver Izayah Cummings‍ has quietly had this trip to South Bend booked for a while and is looking forward to seeing what Notre Dame is all about. He’s got more than 10 offers from schools like Purdue, Kentucky, Louisville, Missouri and Virginia among others. 2020 Michigan athlete Cameron Martinez‍ continues to see his recruiting profile expand. He has a nice set of early offers, including Northwestern, Indiana, Kentucky, Boston College and Syracuse among others. He was at Notre Dame for a camp in the summer and the Irish were intrigued enough to ask him to stay and do defensive back drills after spending the bulk of the camp at wide receiver. A trio of top 2020 Minnesota prospects will be making the trip out to South Bend after Minnehaha Academy’s playoff game tonight. Linebacker Kaden Johnson‍ played for the same youth program as Michael Floyd and has been looking forward to this visit for months. His current offer sheet includes Wisconsin, Nebraska, Northwestern, Iowa, Iowa State, Purdue and Vanderbilt. “I like how they’re always playing the best,” Johnson told us. “Like I said, a former player who came from my club went there. I just want to see what an actual game is like. The stadium is always packed, so I’m ready for that gameday experience to actually see and feel a Notre Dame game. Minnehaha safety Craig McDonald‍ has early offers from Minnesota, Iowa, Iowa State and Purdue. With most of his contact with Notre Dame to this point coming via mail, McDonald is looking forward to meeting members of the Irish staff and seeing the facilities. Minnehaha quarterback Jalen Suggs‍ will also be joining the group. Suggs is a legit football prospect, but he’s a five-star basketball prospect as a 6-foot-5 point guard, so you can bet Mike Brey and his staff will be looking to get some time with Suggs while he’s in town as well. Hawaii DB Alaka'i Gilman‍, the younger brother of current Irish safety Alohi Gilman, is making the trip to South Bend this weekend following visits to Arizona and Arizona State. The Punahou High School standout already has offers from Arizona State and Hawaii. Mississippi offensive lineman Eli Acker‍ made an early commitment to Ole Miss, but his coach told us this week that he was still evaluating all of his options, which is what will bring him to Notre Dame this weekend. Check out our full Visit List for information on all of the weekend visitors, including a few top 2021 targets worth keeping an eye on.